John Thomas Hempsall’s father William Hempsall worked in the ironstone quarries after moving to Gelston, probably after his second marriage in 1880. However, his wife died shortly afterwards and was buried at Hough. John’s mother was William’s 3rd (and much younger) wife, Millicent. John was born in Frieston in 1893 and worked there as a farm labourer. After his marriage to Annie Curtis at Caythorpe on Boxing Day 1911 they moved to Normanton on Cliffe. 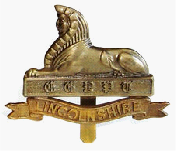 At the outbreak of the Great War (Aug 1914) he joined 7th Battalion, Lincolnshire Regiment at Grantham. His half brother William, who was 20 years older, had served in the Boer War and on the North West Frontier before emigrating to the USA in 1912. John’s first 11 months of service were spent training in England but then the Regiment was sent to France in June 1915. He told his family he’d seen many actions and he’d been wounded in the face. He served as a bomb (grenade) thrower. In early 1916 he was home on leave, but after returning to France his unit was deployed to the canal sector in the southern part of the Ypres salient. A week later on 14th Feb, 7th Lincs were defending a man-made hill known as The Bluff when it was heavily shelled by the Germans. After blowing up 3 mines the Germans attacked and captured the British front line trenches. Private Hempsall was reported as being killed by shell fire on 15th Feb. His body was never found, but his name is recorded on the Menin Gate in Ypres. He was 23 and left a widow and 3 sons. John Hempsall is listed on the Caythorpe and Normanton War Memorials.